Have you ever felt the need to cook something on your own only in a few minutes without spending a lot? Then Built2Cook could be of help for you to get all best ingredients within an affordable price. 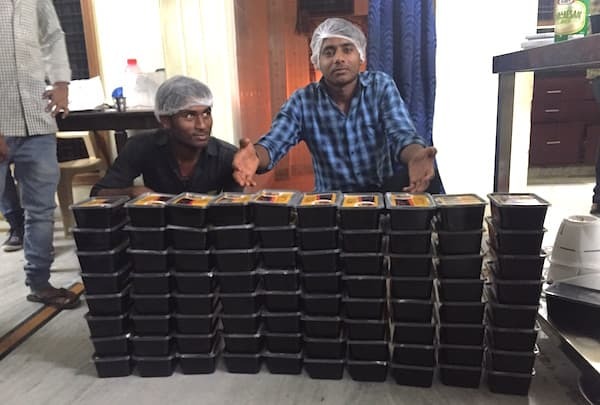 Altaf Saiyed got this idea of exclusive ingredient-delivery startup in May 2015 which will help us provide delicious and healthy food at affordable prices. "We developed a ready to eat model with very specific clientele in mind and that helped us achieve higher numbers", says Altaf. Built2Cook is currently operational in Mumbai and Hyderabad Area. With hundreds of recipes and innovative 'Cook-Book' option, Built2Cook manages to provide users with correct ingredients making it a foolproof way to cook. Altaf holds a degree in Medical Biochemistry from University of Glasgow and also holds a MBA from Stanford. Built2Cook is his first startup. In this exclusive interview with us, we got Altaf Saiyed to talk about his venture, the challenges they faced, their team and the food-tech startup industry. Read On! CE: Tell us the insider story of Built2Cook? What is the idea behind Built2Cook? Altaf Saiyed: Idea for Built2cook came when I was working for an IT/ITES company. My portfolio demanded me to travel a lot and I usually stayed in company guesthouse. I traveled to Noida, Hyderabad, Chennai and Mumbai. Except Hyderabad, all locations are remote and it’s difficult to get out and get some food at 11 pm (time to go out from office) and the food at guesthouse, in polite language, is not so good. I just moved back to India after my MBA (Stanford Graduate school of business) and had a very limited social life. One weekend I got bored and called up a friend who is a chef in 5-Star hotel and told him to give me recipe that I can cook. He gave me detailed recipe for pad thai. I spent around Rs. 2000 and half day to get all the ingredients. Unfortunately, the dish still tasted horrible. I took all the ingredients with me to Hyderabad and this time during my cooking experiment I called up chef and told him to be on phone and guide me through each step. Pad thai turned out amazing. I started thinking this whole process of cooking shouldn’t be this difficult. I started the company with a vision in mind “How do I make great food convenient”. Fortunately, my first few partners bought into my vision. CE: What were the challenges of taking your idea off the ground? Altaf Saiyed: I think the biggest challenge is man power. I have been fortunate with my team, everyone believes in the vision and they are working day and night to make great food convenient. One of the big problems for us as well was getting people to work for a new project. CE: Is your company bootstrapped? Are you looking for funding? Is the company profitable yet? Altaf Saiyed: We got an initial fund from friends and family once we proved that there is a market for our product. We are currently looking for funds. CE: What is the option - Cook Book mentioned on the website? Tell us more about it. Altaf Saiyed: Cookbook- mentions all the recipes that were ever delivered by us. From day one to today. We will get few back as per season. CE: What is the most difficult situation you have had to face while running this startup and how did you tackle it? Altaf Saiyed: Getting consistency in food is a difficult task. My chefs played a major role to achieve this. My job was only to get them on the team. Altaf Saiyed: Best part - My team. It is great to work with like-minded people who are running faster then what you believed is possible. There is no worst part. CE: What according to you, are the 3 biggest challenges related to a food-tech startup and how did you tackle them ? Consistency in taste- Solution good operational head who knows your product. Hygiene – Strong process and check list to get highest standards of cleaning (not an area where we want to save money). Advice from experts. Customer complains- Food is one industry where doesn’t matter how good you are there will be 10% of population who might not like the taste and they are not wrong in saying that. Some people like spicy few don’t. We cannot solve this problem but we address it by a call and see if we can customise a meal for a unsatisfied customer. Max time for call is within 12 hours. CE: How was the response to Built2Cook in its initial days? Compared to that, how many orders do you guys process on daily basis? Altaf Saiyed: It took sometime to warm up. But we picked it up in last three months. We are doing close to 1000 boxes/day. CE: How big is the Built2Cook team at moment? How do you manage your teams? Where is the Built2Cook office located? CE: How do you go about managing personal and professional commitments? Altaf Saiyed: I try to never back off my commitment but since last few months there hasn’t been much of a personal life. CE: What advice would you give about running a company to entrepreneurs who are just about to start? Altaf Saiyed: Take time to select your team. They are going to be your family for a long time. If you can’t have fun with them, it might just turn out to be a little hard to work 14 hrs a day.